Koma Language Services counts on a wide variety of language courses and courses for specific purposes: intensive and extensive, immersion courses, courses for telephoning, preparation for official exams, and multimedia courses. We arrange stays abroad, courses for both general and business English as well as technical English courses. 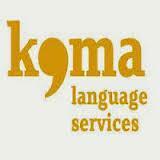 Koma Language Services identifies your needs and offers the perfect solution in language training through its Language Training Schemes (based on the Common European Framework of Reference for Languages – CEFR – and the European Language Portfolio – ELP-) and the languages offered: English, German, French, Basque, Spanish, Chinese, Russian, Polish, etc. Whether you are a company, an area or department of human resources, training, training people specialist, or you are an institution, Koma Language Services offers you a solution to your global linguistic and language training requirements through our Language Training Service (English, Spanish, Basque, French, German, Chinese, Russian, Polish, Dutch, Arabic, etc.) with different types of courses and subject matters by adjusting and adapting them to your activity and language requirements. Koma Language Services offers you extensive, intensive and immersion courses, and courses on telephone conversation, preparation of official exams, multimedia, stays abroad, general, commercial, business and technical courses, etc. and, if you wish, we can arrange for the subsidies which your company may benefit from, thereby reducing your training costs, through the Tripartite Foundation for On-the-Job Training, for we are an organizer firm.